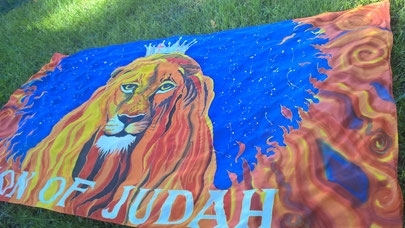 King/Lion of Judah Billow - 3 Strand Cord Silks - Glowing Silk Flags & Billows based on the Bible, Jesus and His Church, to enhance your worship of God! Majestic Lion with Crown gazes upon the viewer as flames rise all around Him! This is the Lion of Judah, the King of the Jews - the One Who is watching over His people! Hand painted on fine silk (as always) about 9.5 ft long and 55" wide. Use as a Billow, Flag or Wall Hanging. Magnificent!! There is not another Billow/Flag like this one, anywhere! Pockets for rods or poles on each side. Makes a powerful statement - as a billow, flag or wall hanging.